Though New Haven is commonly associated with authentic Italian cuisine, the city also teems with Indian restaurants. Identifiable by its use of curries and colorful spices, Indian food bursts with flavor, ranging from light, lentil soups to charred tandoori chicken. The Indian cuisine provides many healthy vegetarian alternatives for those who prefer it, and is well-known for its delicious, leavened flat bread known as naan. Olivia Capasso ’19 and a few friends visited five Indian restaurants in New Haven-- Sitar, Tikkaway Grill, Thali, Zaroka, and Naan Kabab. Located just four miles away from our campus, Sitar is a delicious and accessible option if you’re craving Indian food in New Haven. When Sara Chung ’19 and I first visited the restaurant on a Sunday afternoon, we were pleased to see the tidy and welcoming facade of the stand-alone building on the corner of Grove Street with ample parking nearby. Our first impressions upon entering the restaurant were positive; the spacious room was clean and decorated with Indian art, and we were warmly greeted by our waiter. Chung indicated the buffet on the countertop on the opposite side of the room, and we helped ourselves to a bit of everything. In total, there were about eight dishes, including saag paneer, a leaf based dish; chicken biryani, fried eggplant, raita, naan, chicken vindaloo, lentil soup, and several types of rice. Overall the meal at Sitar was delicious, though Chung said that “the vegetarian options were unremarkable, with the exception of the saag paneer.” My personal favorite of the group was the chicken vindaloo, a popular curry dish made with a delectable, spicy sauce and cubed chicken thighs. Finally, Chung and I received the bill and were pleasantly surprised by the price; the buffet totaled ten dollars per person, an extremely reasonable price for the quality of food we experienced. “I would definitely come here again if I’m in the area since it’s so well priced, and you can even get 10% off the meal if you have your student ID, which is great,” said Chung. Satisfied, Chung and I departed Sitar with full stomachs and smiles on our faces. With two convenient New Haven locations, Tikkaway Grill is the Indian version of the much-loved Chipotle. The restaurant is nestled on the corner of Orange Street and Chapel, and serves as a popular eat-in or takeout location for Yale students. Chung and I entered Tikkaway at about 8 p.m. on a Friday night and were warmly greeted by the cashier and a bustling crowd. All along the walls, colorful post-it notes were written and hung by happy customers, and a large window opened up the small room to the night life outside. In the middle of the room hung a large sign listing the three base meals one could order: a whole wheat roti wrap, a salad bowl, or a basmati rice bowl. Below the sign was an array of ingredients which you could add to your base. I ordered the roti wrap, resembling a burrito, with a filling of chicken and potato, as well as lettuce and a spicy vindaloo sauce. Chung stuck to her Chipotle roots and ordered her personal favorite, the bowl, with chickpeas, potato, tomato, and cilantro. “I think we’re going to need more than one water,” said Chung with tears in her eyes after tasting several of the restaurant’s signature spices. She was right; though delicious, our dishes were incredibly spicy and required many napkins, as well. The roti wrap was fresh, as were the ingredients; however, the flavors were seemingly overcome by the vindaloo sauce and masked by its heat. Chung said, “The bowl is really good. It hasn’t quite crossed the line of spiciness, so I can still enjoy it.” Chung was pleased after finishing her tame meal, as was I when the bill totaled just under seventeen dollars, including tax. “I’d definitely recommend Tikkaway to anyone looking for a quick, takeout meal in New Haven,” said Chung as we left the restaurant. 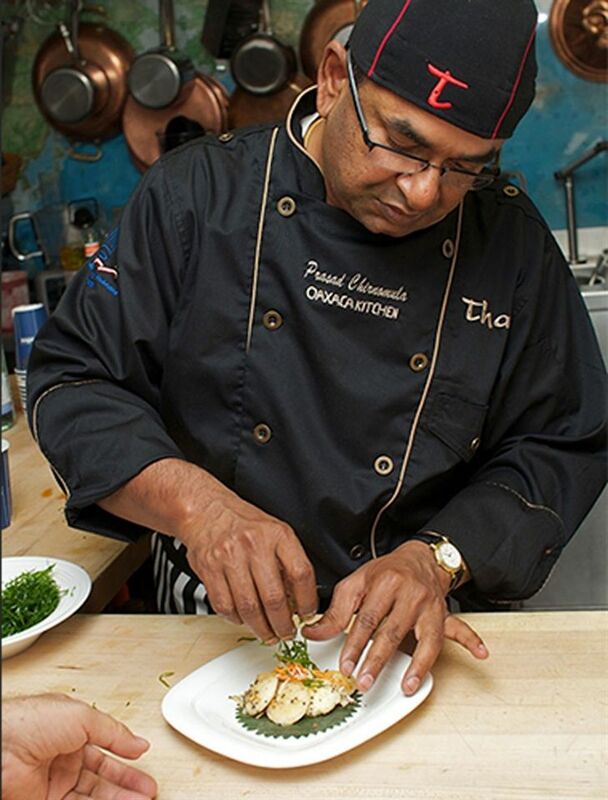 In New Haven alone, Thali has three locations for delicious, upscale Indian food. Chung, Izzy Alarcon ’19, and I decided to see just how good this place really was. Situated on Orange Street, the restaurant’s facade was a stately brick, and its large windows extended halfway down the block. The large room was warmly lit, well decorated, and spacious-ideal for big groups or parties. We were led to a small table by the windows and immediately approached by our waitress, who patiently explained the menu and specials of the night. “I’m not loving these prices,” said Chung. The entrees ranged from twenty-five to twenty-eight dollars, so none of us was too thrilled, but, nonetheless, I was convinced this meal would be well worth it. We decided to order two entrees: the baigan bhurtha and chicken biryani, as well as naan to share. Baigan bhurtha is a traditional Indian dish consisting of smoked eggplant, typically smashed and cooked with tomatoes and green peas. The chicken biryani is prepared with basmati rice, fresh herbs, cardamom, mint, and saffron in sealed pots. Both dishes came out hot and in large portions, though they were manageable when shared among three people. The eggplant dish was delicious, and consisted of an appetizing array of regional curries and proteins. Similarly, the chicken was well prepared and flavorful, leaving us content at the end of our meal. “That was just enough for all of us to share,” Alarcon remarked. Our entrees and two servings of naan totaled to just over forty dollars including tip, which was a bit pricey, but to be expected. “I’d come here with a bigger group, as the portions are more family sized, but at least we have leftovers for later,” Chung commented. Situated next to a parking garage on York Street, the exterior of Zaroka was unappealing and looked cramped. Sana Patel ’19 and I decided to try out this restaurant and see how it compared to others. Similar to Sitar, Zaroka provided a vast lunch buffet, though the dull orange walls and green booths were not nearly as alluring. “Hopefully, the food tastes better than the restaurant looks,” Patel said. Luckily, this was the case. We approached the buffet, plates in hand, and surveyed the choices before us. The dishes were almost identical to that of Sitar; there were about ten items to choose from, including tandoori chicken, a pancake consisting of peas and carrots, samosas, and a mushroom dish. “This pancake makes me want to go vegetarian,” said Patel, clearly enjoying herself. Overall, the meal was pleasant, though we agreed that the rice was awfully dry and bland. The buffet totaled to twenty five dollars without tip, a sensible price for the quality of food and service we experienced. “The food was satisfying, but I’d do takeout in the future since I’m not really a fan of the interior,” said Patel at the end of our meal. Together, we ordered two samosa chats, chicken tikka masala, tandoori chicken, and plain naan. The food took no longer than seven minutes to arrive at our table, and was steaming hot upon delivery. With the exception of the tandoori chicken, which was a bit dry, all of the dishes were delicious and came in reasonable portions. “The sauce on the chicken tikka masala makes the dish. I’d order more of it if I wasn’t full already,” said Chung. Though the appearance of the building was unappealing, Naan Kabab proved to be much more impressive than its facade. The meal totaled to just short of twenty dollars, a very reasonable price for the quality of food we received. “Great place for both takeout and dining in if you’re in the mood for some Indian food. We’re definitely returning here,” concluded Chung.